In today’s blog post I want to show you just a few examples of how you can make money using RocketBar. However, please bear in mind that the special offer for RocketBar is ENDING in TWO days so if you haven’t got your lifetime access yet then act quickly. With RocketBar you can make a profit simply by sharing trending or popular news articles and stories on social media, forums, websites. Wherever! 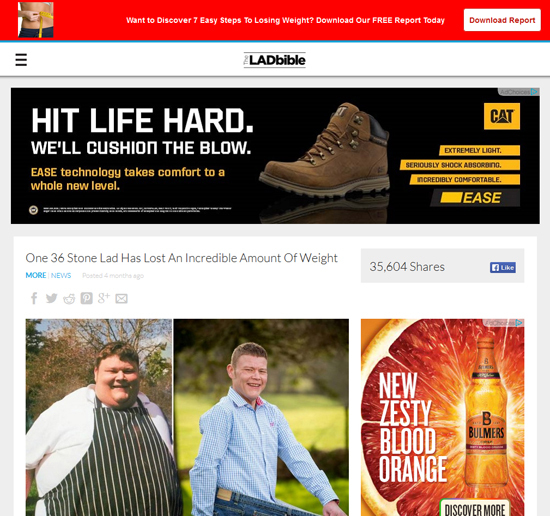 Sites like Lad Bible and Huffington Post for example create content that goes viral every single day. Their content is loved by many and as a result people SHARE it. So, how do you profit from that? This is where RocketBar comes in and I’m going to give you a few examples below just so it gets your creative juices flowing. RocketBar literally takes less than a minute to setup and it allows you to add “Call-to-Action” banners and opt-ins to the top or bottom of ANY site. 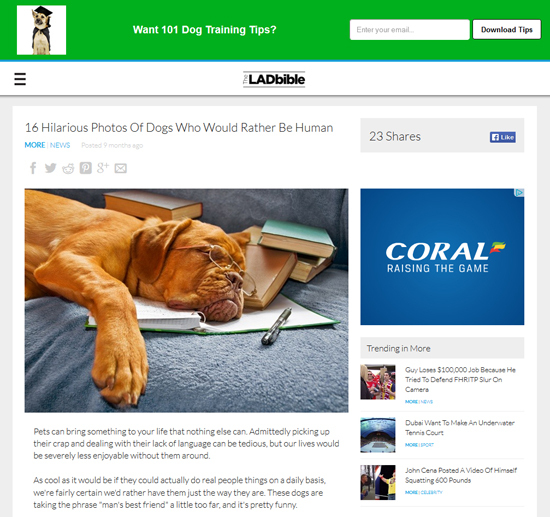 Sites like Lad Bible, Huffington Post and the BBC. It then generates a special link for you that you can post and share ANYWHERE. All you are doing is sharing viral content that people like to read (or watch) and which they often then share themselves. Every time someone shares YOUR link MORE people will see the the story or content… The only difference is… It is monetized with YOUR call-to action. It’s a powerful and unique way in which to make sales and build your own niche specific mailing list. Drones are becoming more and more popular. Well, they certainly are here in the UK anyway and more importantly there is a lot of controversy surrounding them. 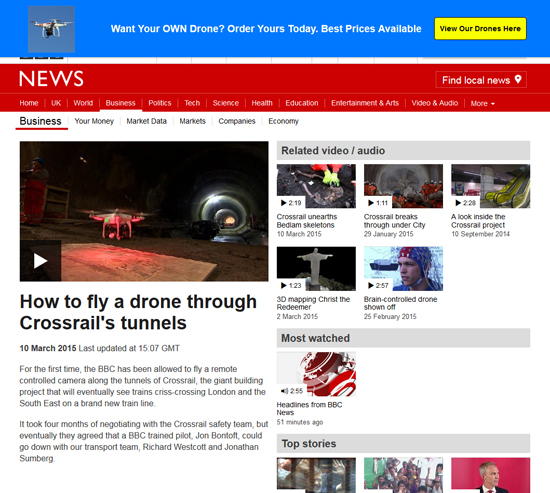 So, in the example below I found a news story on the BBC where a drone was flown down a large tunnel. Here is an example of how you could monetize this page (link) by adding a banner that then links to Amazon using YOUR affiliate link. You will see a BLUE bar at the top that includes my call-to-action – “Want Your OWN Drone? Order Yours Today. Best Prices Available” and a button. This is a numbers game so the more times your link gets re-shared and distributed the more people will see your call-to-action and SOME of them might “Buy” on impulse. After all… Drones are cool and this video is pretty neat. Weight loss is always a hot topic and although it may be hard to muscle your way into this saturated niche… Doing it virally using this method might be easier than you think. People love to read and share inspirational “Weight Loss” success stories. Here is an example of how you can distribute a REPORT without an email optin. I would ALWAYS recommend collecting leads but it’s also possible to freely give away reports. However, you could include information and links to affiliated products inside your report. My example call-to-action message here is – “Want to Discover 7 Easy Steps To Losing Weight? Download Our FREE Report Today” with a “Download Report” button. One of the most popular types of content being shared on Facebook and other social media are themed around “Animals”. People LOVE animals. However, most of the people who click through to see funny cat photos or funny videos about dogs tend to be cat or dog lovers themselves and usually own one (or two) themselves. Here is an example of how you can build a mailing list by offering a simple report. Ready To Try Out RocketBar? RocketBar is exceptional value and will barely cost a fraction of what you think it will cost. However, their special launch offer is ending in two days so don’t hang around with this one. Remember, you can literally jump straight in and start sharing your links and making money right away. If you haven’t already seen my 4 tips for getting the most from RocketBar then you can see them HERE. Don’t forget that there are some cool BONUSES waiting for you in the members area too. Hope you enjoyed this post and if you decide it is for you.. Have fun and I wish you the best of luck with it.